SSQ Financial Group operates as one of Canada’s leading providers of group and individual income protection insurance through a selection of life, critical illness, and creditor protection. SSQ’s insurance products offer even more income protection by including a disability support benefit on every plan, ensuring that loss of work won’t impact your finances. Term Life 10, 15, 20, 25, 30, 35 Year Terms Ages 18 to 70 Guaranteed rates for length of term. Renewable and convertible without medical exam. Includes a total disability protection plan. Term 100 Life To Age 100 Ages 0 to 75 Level cost of insurance for life. Included total disability protection plan. Whole Life To Age 100 with 20-year pay option Ages 0 to 75 Level cost of insurance for life. Included total disability protection plan. A cash value builds over time on this policy. Universal Life To age 100 or yearly renewable Ages 0 to 80 (T100) Ages 0 to 85 (YRT) Choice of 1, 3, 5, and 10 year guaranteed investment accounts. Included total disability protection plan. Critical Illness Insurance/b> 10, 20 Year Terms, To age 75, to Age 100, or To Age 100 with 20-year pay. Ages 0 to 65 Choice of 3 covered or 25 covered illnesses, or 28 for children. Medical referral benefit at no extra cost. Term plans are renewable and convertible without a medical exam. 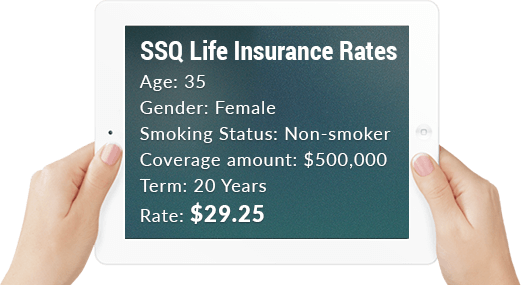 We are pleased to offer all life insurance products provided by SSQ. For a quote on all available life insurance plans, please use our no-obligation quote provided on the right to explore your options and find the right fit for your needs.